Add milk and egg yolks to a medium saucepan and whisk. Add sugar, flour, and salt and whisk until smooth. Cook over medium heat, stirring constantly, 20 minutes or until thickened. If it’s not getting as thick as you’d like after 20 minutes, feel free to add another teaspoon of flour. Remove from heat; stir in the vanilla. If serving this at a dinner party or for a large group I recommend a glass bowl or trifle dish. I was bringing these into work or packing for lunch so I collected every small glass jar I had in my kitchen to make individual servings. 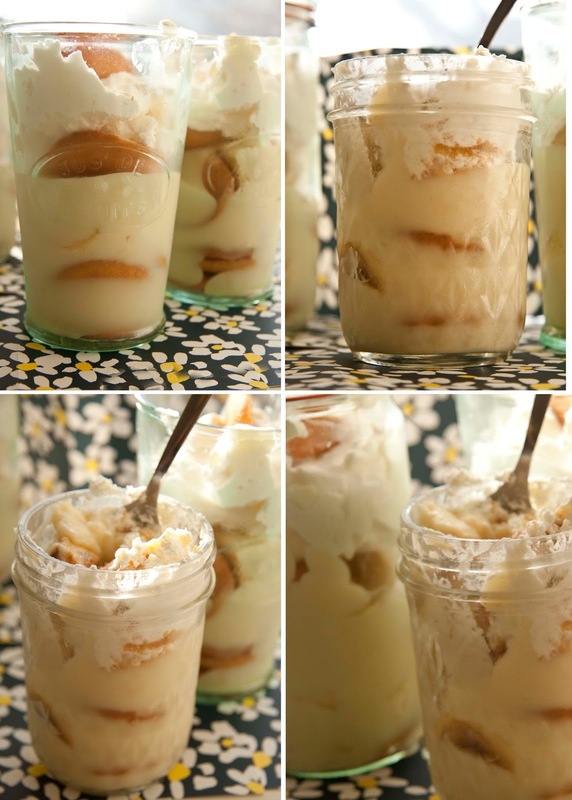 For either, arrange vanilla wafers in bottom of a small serving dish (or jelly canning/mason jars). Slice and divide 1 banana and layer over wafers. Spoon custard over bananas. Start next layer of Nilla wafers and another banana, than pudding. Repeat until pudding is gone and you have a few solid layers. Beat heavy cream at medium speed with an electric mixer until it starts to thicken; add remaining 1 tsp vanilla and gradually add powdered sugar to mixture, beating until soft peaks form. Spread over custard. Serve immediately or cover and chill. 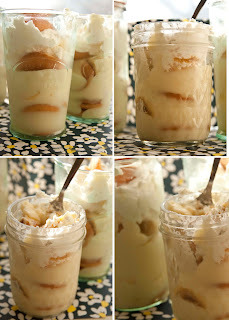 I prefer my banana pudding cold. Spoon, lick, make Mmmm noises and enjoy.